True Blue and Warm, Too! After all, they are truly one of the freest creatures on the planet, able to fly anywhere at anytime with nothing to bind them to any single location. These birds are not only loyal to a specific location, but also to a single feeder! The study showed that the only time they abandoned their favorite feeder was during periods of cold weather when the feeder was placed in a location too exposed to the wind. 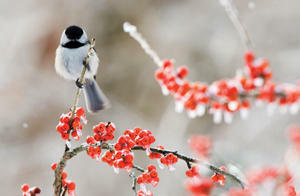 Once you have them in a safe and sheltered location, be sure to keep your feeders filled with the high-energy, high-fat foods that provide your birds with the crucial nutrition they need to survive the coldest month of the year. Take a look inside for more of our expert advice and quality products that will help your birds to stay true blue and warm, too this winter.